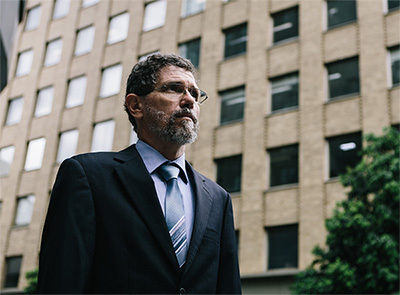 Peter Ridd in Brisbane getting ready for the trial. If James Cook Uni (JCU) wins, they lose. Whatever happens, the taxpayer lost a long time ago. Ridd’s employment contract says he has the right to speak freely, but the universities “Code of Conduct” pretty much says the opposite. He’s allowed to air unpopular opinions even about JCU, but at the same time he must also uphold the integrity of the university and respect the reputation of colleagues. In other words, the university can ignore you or sack you depending on which tribe you are in (Gravy-making, or Gravy-threatening), and then some lawyers can buy a yacht. JCU already have a dismal record of isolating, blackbanning, and ousting people who disagree with the consensus (vale, Bob Carter!) When Ridd suggested we can’t trust our scientific institutions, JCU censured him, then ordered him not to mention the censure too. Let’s censor the censure! Then they trawled through his private emails as well, hunting for more ammunition … yeah sure, just what any rigorous institute would do. Since then, a JCU former employee has been caught doing Fake science on fake fish. They’re so “concerned” they’ve taken a whole year just to form an investigative panel. Ridd discovered the fake flipped lionfish photos. He is the kind guy that saves a great institute’s reputation. If only JCU was great. Last week Trump told universities – No free speech means no federal grants OK? No one needs a court case. You either have free speech or you don’t. It’s safe to assume that institutions that don’t allow criticism are harboring incompetent rent seekers. If their staff were capable, they would defend themselves. Good institutions sack incompetent staff. Weak ones sack the good ones who make the weak ones “look bad”. Where are our taxpayer representatives? When the Left talks derisively about ‘climate deniers’, they probably imagine someone very different from Dr Peter Ridd. Bearded, bespectacled and softly-spoken, Ridd is a sandal-wearing one-time Green voter and former president of his local chapter of the Wildlife Protection Society. He is also a marine geophysicist who has been studying the Great Barrier Reef for over 35 years. And like many in his field, Ridd is passionate about his subject. But Ridd is equally passionate about his profession, and has spent years questioning the orthodoxy that climate change is ‘killing the reef’. In speaking out against this climate alarmism, Ridd put himself on a collision course with his employer, James Cook University. After years of warnings, censures and absurd gag orders, Ridd was finally made to walk the plank. Now, he’s fighting back, in a case with momentous implications for free speech in Australia. Reading Ridd’s work can be difficult for a layman. It is detached, dispassionate and everything that scientific writing should be: careful consideration of the evidence followed by a sober conclusion. Take, for example, Ridd’s contribution to the Institute of Public Affairs’ Climate Change: The Facts 2017, in which he dispels the myths about the Great Barrier Reef repeated ad nauseam by climate evangelists. Yes, coral bleaching has occurred, but that is not a new phenomenon. In fact, the white colourisation that creates the ‘bleached’ look is a natural response that enables the coral to adjust to warmer temperatures and, over time, thrive. So why does ‘conventional wisdom’ suggest that the reef is in mortal, man-made danger? Largely because dissenting voices ‘are typically ignored, drowned out and sidelined by the majority’, Ridd writes. ‘There is now an industry that employs thousands of people whose job it is to “save the Great Barrier Reef”. As a scientist, to question the proposition that the reef is damaged is potentially a career-ending move’. Ridd’s biggest beef is with the questionable marine science fuelling the save-the-reef hysteria. The ‘peer review’ process feted by ‘the-science-is-settled’ types is not the guarantee of scientific authenticity that its name suggests. Peer review, according to Ridd, ‘usually consists of a cursory read of the scientific paper, often just for a couple of hours, by two scientists. They never have time to check the data property, or to try to repeat the analyses’. But the minute Ridd blew the whistle on this shoddy science, he was a goner. Given JCU’s extensive interest in reef science, publicly questioning their methodology was arguably always going to make him an irritant. Ridd had been on JCU’s radar for some time, but the publication of his chapter in Climate Change: The Facts transformed his struggle from the occasional skirmish to all-out war. After a subsequent interview on Sky News, a barrage of letters from the university started, accusing Ridd of ‘serious misconduct’ on several trumped-up grounds. When Ridd publicly – and understandably – objected to his treatment by the university, JCU accused him of ‘denigrating’ the university, ‘interfering with the disciplinary process’, even of being ‘insubordinate’. And when public statements weren’t enough, the university searched his email account to dig up further breaches of the code. Worse still, JCU has slapped Ridd with numerous ‘confidentiality’ directions in relation to the disciplinary process. As Ridd has correctly pointed out, gag orders of this nature effectively create a star chamber in which ‘victims are isolated, subjected to a closed disciplinary procedure where highly subjective concepts are applied’. Ridd’s ordeal culminated in his termination in May last year. He has taken legal action in response, in part with the help of a campaign on crowdfunding website GoFundMe. Thousands of Australians donated, and the campaign amassed over $250,000 in just a few days. Ridd will have his day in court in Brisbane later this month. Ridd has much in his favour. The enterprise bargaining agreement covering JCU staff – essentially Ridd’s employment contract – has extensive free speech protections. Under the agreement, staff have the express right to air unpopular or controversial views, and participate in wider public debate. Importantly, they are also entitled to express public opinions about the operation of JCU and university decisions. The problem for Ridd is he is also subject to JCU’s staff code of conduct, which imposes all manner of vague requirements, like behaving ‘in a way that upholds the integrity and good nature of the university’. Under the pretext of this code, JCU has hit Ridd with a barrage of outlandish claims of alleged breaches, such as failure to be ‘collegial’ and ‘respect the reputations of other colleagues’. JCU would have this dispute reduced to the narrow legal matter of which document trumps the other. Is it the enterprise bargaining agreement, with its protection of academic freedom? Or is it the code of conduct, with its rubbery obligations of ‘collegiality’? But this case is about more than that. It will decide what academic freedom means, what intellectual inquiry means, what free and open debate means. And it is about whether a binding legal agreement promising these things can be rendered meaningless by a cadre of self-interested university administrators via an Orwellian code of conduct and a Kafkaesque disciplinary process. And above all, this case is about the simmering free speech crisis at Australian universities, about places of higher learning that place their own reputations above the search for truth. Throughout this sorry saga, JCU has justified their railroading of Ridd on the basis of a requirement to protect the ‘integrity and reputation’ of the university. But all Ridd was doing was belling the cat on scientific standards that were at best sloppy and at worst dishonest. No doubt exposing such academic quackery probably does compromise JCU’s integrity and reputation, but deservedly so. It would appear, then, that rules against compromising that precious reputation are really just a protection racket. They are a velvet glove with which to stamp out dissent. We should be grateful that Peter Ridd is one target who will not go quietly.